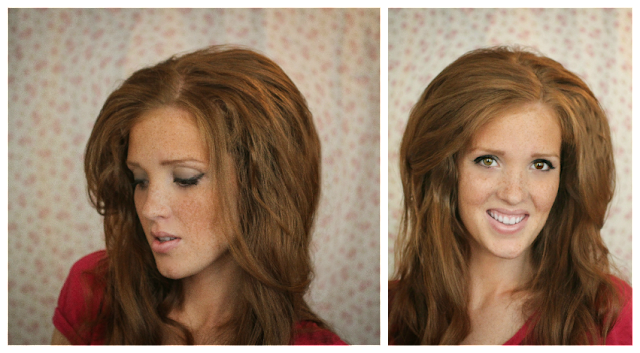 The Freckled Fox: Hair Tutorial // Huge Volume With No Teasing! Hair Tutorial // Huge Volume With No Teasing! I never realized quite how vast the search was for volume until I wrote what I thought was a quick filler post (Teasing 101), and before I knew it it had been pinned over 80,000 times! Whoa whoa! The only thing people wonder I think though is if it is possible to achieve huge volume without teasing or adding swimming noodles to their hair.haha So here it is!! Step #1: Section off the top quarter of your hair and secure it with a clip. Section off the next quarter and do the same, repeating with the third section, but then leaving the fourth section out to deal with first. Step #2: Begin crimping the roots right next to your head with your hot waver or crimper. Make sure you're lifting the hair up and away from your scalp. You'll repeat it about four times on each section (except the top one) all the way around your head. Use your hairspray. Step #3: Once you've finished crimping your roots all the way around your head (only your roots! 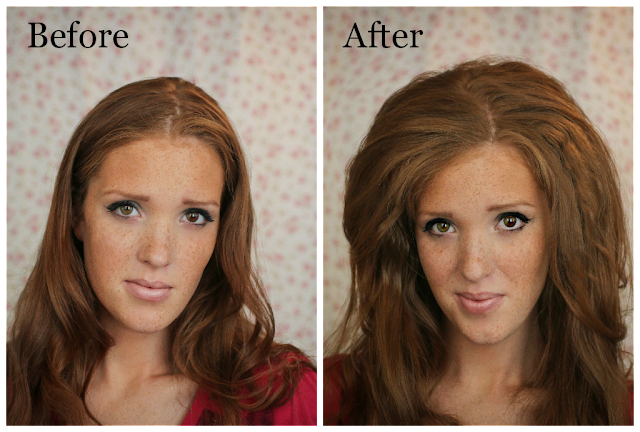 ), lift your hair and give it a few spritzes of hairspray for hold. Un-clip the top section of your hair, smoothe it out over the rest of your hair with a comb, and you're ready to style! Result: Big I know, but now you have the perfect base for any style you wanna do. From here I usually put in hot rollers or curl a little for waves. The volume can be minipulated as much as you want, but will last until your next shower, and then will come right out! no problem! Glad to hear it! <3 You are the best! What a unique idea- I'm going to try this for sure! Thanks!! I know! haha I laugh at myself.haha I was like "Honey my hair is HUGE!" but hey, I guess I just see it as you can always tame your hair down, but the hard part is getting it to stay UP! I hate teasing too. I envision my hear breaking every time. This should help. I know! I always cringe when I do it:( haha hope this works for you! I'm impressed! I'm a huge advocate for big, big hair, and with all of the teasing I do, I've noticed my hair showing signs of damage. I'm going to try to recreate this if I can ever get my hands on a crimper. :) How would you do this with a curling iron? I found mine at walmart, but they're a ton of other places too! Its not quite as effective using a curling iron only, but you just make sure that you're clamping down on your hair close to your root as possible, also make sure your hair is coming up before going down, you know? Then all I do is spray the heck out of it to make it very stiff.haha once you've piled a few of these on top of each other, it should work just about the same! I have realllllly long hair too. This will come in handy. Thank you so much for this post! NO MORE TEASING/Destroying my hair! Wow!!! That's awesome! And my sister just bought one of those wavers. Totally stealing it. Awesome idea! Finally big hair with no teasing ;) I will definitely try this soon. Awesome! I love finding other ways to achieve this look than just the regular old teasing. Have you ever tried teasing powder? It works wonders too! :D You have an adorable blog btw. Usually I just have to go sleep with my hair wet and I wake up with as much volume as Goku! haha :D great tutorial though! I just flip my hair around! 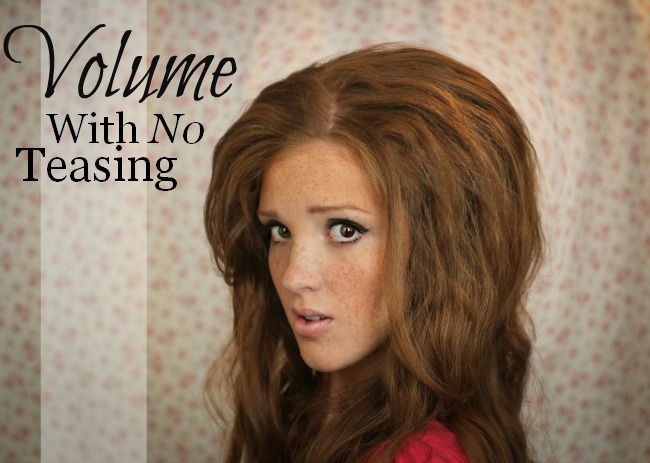 Instant volume! Then again, I'm only 13. What do I know? how would you do that with a curling iron? I do my hair like this almost every day! I love it!